I knew he was up to no good. He and his pals had been casing the joint. I’d run him off several times. In those instances, he’d often jump to a nearby tree, turn, and stare down at me with his dark, beady eyes. Often, I felt that if he believed he could have taken me down, he’d attack. Charlie the Squirrel, as I came to call him, had the last laugh, though. I’d told Charlie that we were pulling out of his hood the next day, but he couldn’t just let us go. For a week, I’d thwarted his attempts to make a nest underneath our awning slide over the living and dining areas. Knowing it was his last chance, Charlie, perhaps even with some of the rest of his gang, made sure our camper did not leave unscathed. Just before dark our last evening, I was outside the camper, trying to start prepping for our imminent move. There he was; the fat little rodent was sitting on the back edge of the slide out. He had a smirk on his face. He wanted to make sure I looked at him sitting THERE. I yelled at him, and he jumped to the tree, but not without a final “I got you look” before jumping down and scampering away – probably to laugh with his critter friends about how he really got that human. 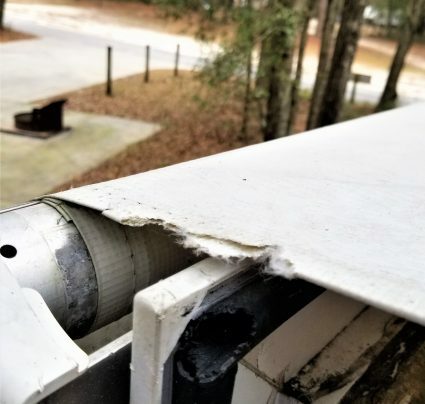 After consulting with our RV maintenance and repair specialist at Shelby RV, we have a plan to repair the damage the best we can, at least for the short-term, while on the road. Still, two items go on our annual repair list for when we return to Tennessee in 2019, Those are two things that should not have to be on the list. It’s only because of the criminal element in the campground. We’ve also been advised to get some peppermint oil to mix with water in a spray bottle and spray this on our awnings, air conditioners, openings to vents for the refrigerator, etc. – anything that critters like squirrels and mice might damage. Apparently, the critters don’t care for the smell of peppermint, and their sense of smell is better than ours, so it doesn’t take very much. Guess what’s on my shopping list for this week? Darn Charlie and the Squirrel Gang! Here’s a warning for my fellow campers. 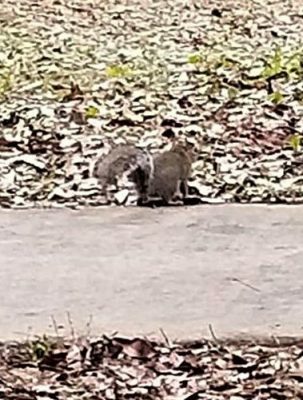 Watch out for the critter criminal element when you visit Suwannee River State Park in Florida (or any park where squirrels may be), or you, too, may be vandalized by Charlie and his Squirrel Gang!